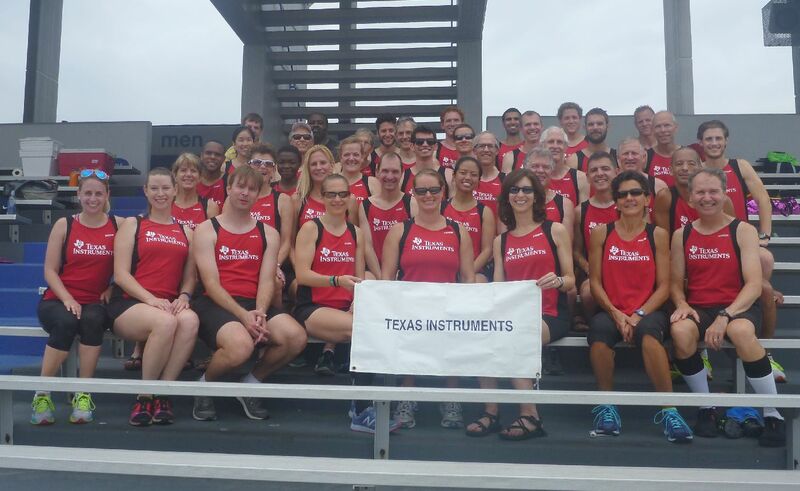 The Texas Instruments Track & Field Team has competed nationally at the United States Corporate Athletic Association (USCAA) Corporate Cup Track Meet since 1979. The final national meet was in 2014. TI participated for 36 years and won 16 national titles. We now focus on the Houston Regional Meet. Almost every event at the meet is a relay or team event with distances ranging from 100M sprints to a 3,200m race (by age group). Field events inlcude high jump, long jump, discus, shot, and javelin. There are legs for various age groups and both sexes. We have runners in their 20's all the way up to people in their 70's. Many organizations at TI are represented. Some MFAB employees also participate in the Maine Regional Meet. The meet rules allow employees, retirees, and contractors working on the TI sites. If you are interested in the team there are several steps below to get started. If you want to see the details of last year's meet go here. Make sure you are on the email list and roster. We'll compete in the Houston and Maine corporate meets. Practice every Wednesday after work at JJ Pearce HS (arrive between 5pm-6pm). Saturday morning practice/time trials at JJ Pearce HS. (arrive at 8am). Corporate Track Meet will be Sat, May 18th in Houston. Printable PDF file with practice information. From inside of TI you can join the list by going to http://list.ti.com and joining "ti-track"
If you can't access the list just enter your email below and we'll add you.